Over the past decade, I have been exploring the links between science, photography and philosophy. This body of research has involved collaborations between myself and a number of scientific institutions, such as UCL and Imperial College London. I am currently undertaking a practice-based MPhil at the Royal College of Art which specifically focuses on the relationship between photography, visual language and astronomy. What can photographic practice and theory contribute to the field of astronomy, and vice versa? The definitions of parallax help us to understand that viewing one object from a number of different perspectives can offer a more accurate reading. I posit that obtaining a deeper knowledge of the links between astronomy and photography can help us to understand more about both fields. In this article, I will share a number of collaborations with scientific institutions that have led to developments in my own research, and further afield. Preservation of Memory, Silver Gelatin Emulsion on Paper, 2012. In 2012, I took part in a residency with the MRC Anatomical Neuropharmacology Unit at Oxford University, initiated by Dr Megan Dowie. My project at the laboratory explored the relationship between photography and memory, focusing on the extensive practice of preservation methods used to store a piece of biological tissue in formaldehyde for future reference. These processes reminded me of the photographic processes I use to preserve an image when printing an analogue photograph in a darkroom. In the laboratory, I was interested in how the scientists were hoping to capture an exact picture of the brain activity of a specimen. However, when the specimen is killed there is a small amount of time before death where the brain activity alters, aware that it is dying. This means that although the specimen is aware of its’ own death, thus slightly changing the result, the data is still useful for the scientists to build up a picture of how memory works. At the MRC Anatomical Neuropharmacology Unit, I became strongly aware of how perception and memory are made up of fragments, composites and imagination. The photograph is akin to memory in this way, both a photograph, a ledger and a memory can often be trusted as a reliable source of evidence. Our understanding of the universe as a whole is entirely dependent on our interpretation of the past through records; photographs, ledgers, memories and traces (fossils, skeletons etc), but the research project at the MRC Anatomical Neuropharmacology Unit made me challenge the authenticity of these fragments. Overall the collaboration changed my perspective on the concept of objectivity in scientific imaging, and deepened my interest in photography. I also saw the potential benefits of challenging the field of objectivity in scientific imaging, as I realised that this is something scientists also think about. For the resultant exhibition “A Nervous Encouter” at Oxford Fire Station Gallery, I used electron microscope ‘electrographs’ of neurons to create analogue negatives. These negatives were projected onto silver gelatin emulsion, that I had roughly applied to the paper surface. The images were then presented in such a way to highlight the fragility of the photographic surface, only partially fixed and subject to fading. Following the residency at the MRC Neuropharmacology Unit, I was inspired to learn more about the role of photography in relation to the history of astronomy. I undertook a residency at Four Corners Film in Bethnal Green, and used this opportunity to explore my ideas in relation to the history and visual language of photography and astronomy. After reading his book “Capturing The Light”, I visited Roger Watson at Lacock Museum of Photography who pointed out that though William Henry Fox Talbot invented the salt printing process, he was also an official observer of the solar eclipse in 1851. Similarly, John Herschel, the inventor of the cyanotype process and of photographic fixer, was also responsible for naming several moons of Saturn. James Clerk Maxwell presented the first durable colour photograph in 1861, yet he also made a contribution to our understanding of electromagnetism and discovered that the rings of Saturn are made of small particles. Roger also mentioned that Louis Daguerre, inventor of the daguerreotype, was in contact with Francois Arago, director of the Observatoire de Paris. Further exploration of these intertwined narratives lead me to understand that the fields of astronomy and photography are intrinsically connected. I subsequently visited the UCL Space History Archive which holds artefacts from elements of space exploration, such as the Lunar Orbiter Probe which went to the Moon in 1966. 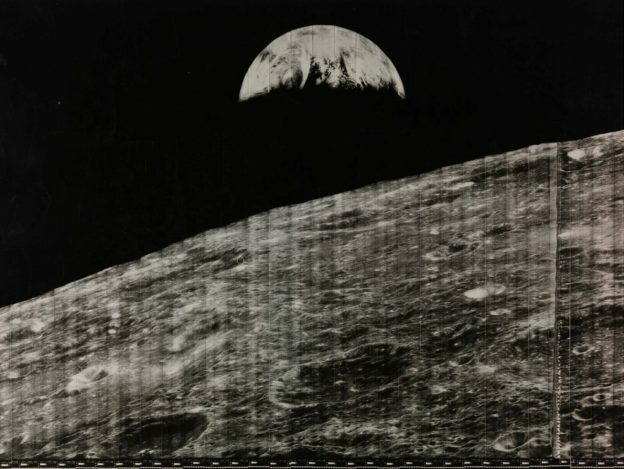 The most intriguing NASA photographs in the UCL Space History Archive collection were the composite images taken on strips of photographic film and placed in such a way to make the joins of the prints quite evident. Earthrise, Lunar Orbiter Probe 1966, UCL Space History Archive. In the essay “Dark Frame / Deep Field” Marek Kukula and Melanie Vandenbrouck discuss “Sensor Flaws and Dead Pixels” by Wolfgang Tillmans. This image is what is called a ‘blank’, which means to say that it is not exposed to light. This is an astrophotography technique which is used to find faults with the digital camera’s sensor so that they cannot be confused with stars. 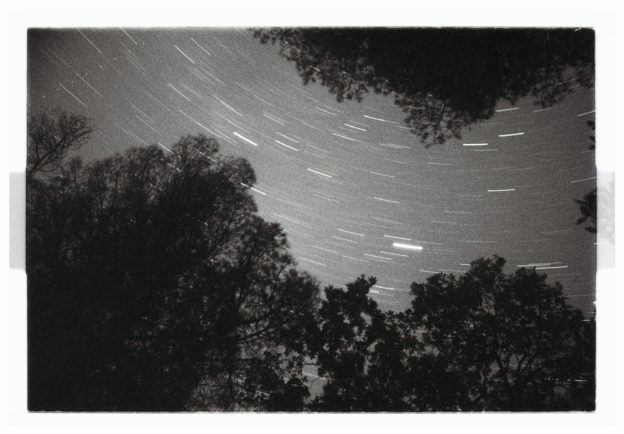 Marek Kukula and Melanie Vandenbrouck, Dark Frame, Deep Field essay for Breese Little. Astronomical photographs in all of their manifestations have issues with what Marek and Melanie call “absolute objectivity”, the telescope, camera and sensors each make their presence known within the image. In a recent project for the “Altered Realities” exhibition at Central Saint Martins, I created a lenticular print of the “Pillars of Creation” which highlighted the difference between the black and white raw mechanical image and the full colour mediated image which we are used to seeing. Zolt Levay from the Space Science Telescope Institute allowed me to use these images, and let me know a little about how each image was produced. Both images tell us something useful: the full colour image is digitally “painted” to signify the chemical composition of the gas clouds, yet the raw image shows artefacts from the process of capture and gives us signs which help us to understand how the image is produced. From both of these images we can make meaningful observations of distant celestial objects, but neither are truly objective. 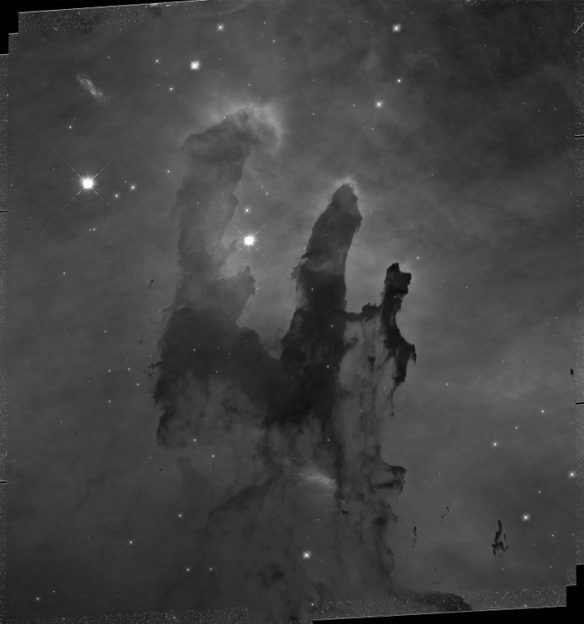 Pillars of Creation, Zolt Levay, Space Science Telescope Institute. An important symposium for my research was the “Envisioning the Universe” seminar at the National Media Museum, convened by Dr Marek Kukula at the National Maritime Museum. At this seminar Elizabeth Kessler spoke about her book “Picturing The Cosmos: The Hubble Telescope and The Astronomical Sublime”. 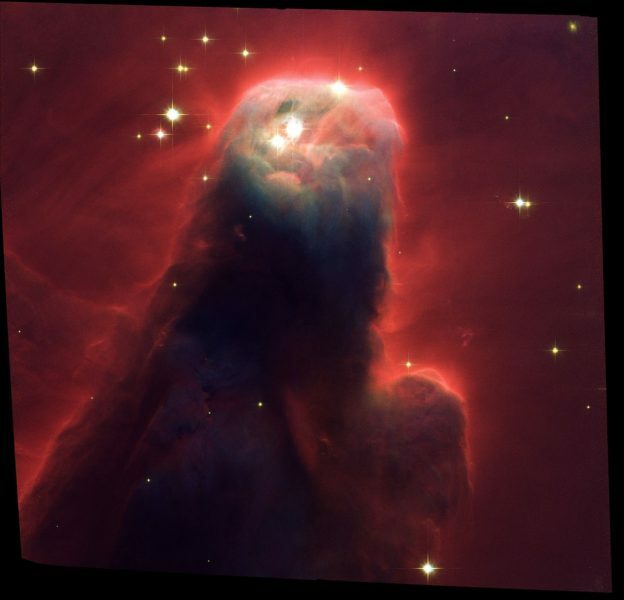 Kessler specifically focused on the highly saturated, high contrast images that NASA produces using the Hubble telescope. Here, Kessler asserts that astronomers have developed representational conventions, suggesting that in the field of astronomical imaging, astronomers can be distinguished by their own aesthetic choices when constructing an image for a publication. Kessler believes that these visual traditions have been adopted from painters such as Thomas Moran and William Henry Jackson, who depicted the American west. 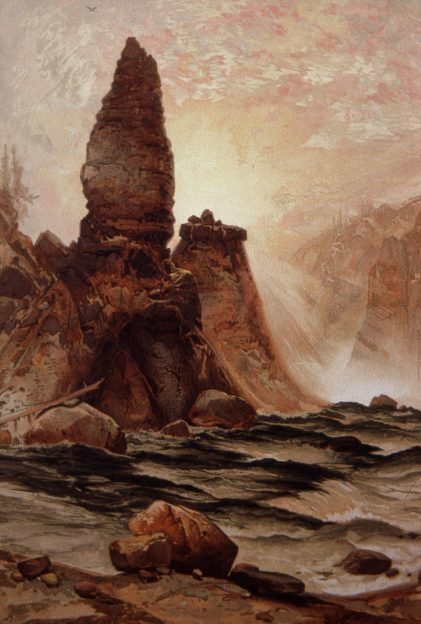 Kessler specifically compares the Cliffs of the Upper Colorado River and Tower of Tower Falls by Thomas Moran to The Cone Nebula. The Tower of Tower Falls, Thomas Moran. Kessler suggests that there are similarities between the two sets of images, these features include isolated landscapes, which are punctuated by immense towers, dramatic light which shines behind an object and theatrical uses of colour. Kessler’s research demonstrates the subjective choices that are used by astronomers when creating an image for public consumption. This seminar highlighted to me the importance of the role that visual language and photography have to play in the field of astronomy. It is clear from Kessler’s text that the history of art has had an impact on how astronomers use colour, framing and contrast to affect how we might read an image. 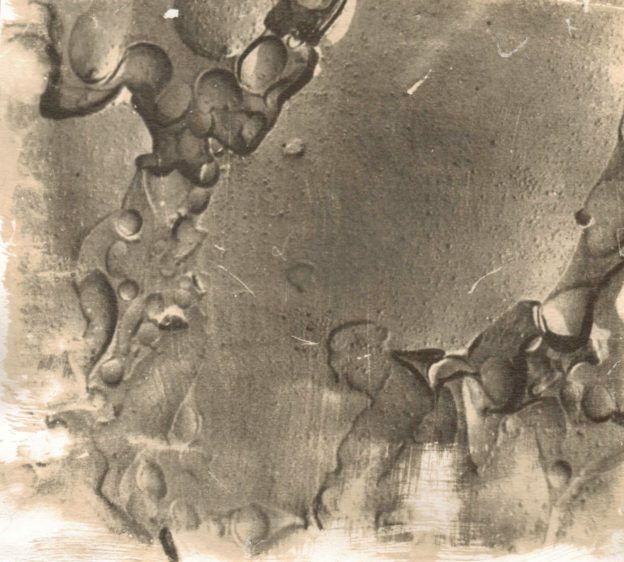 Having learned that presentation methods and materiality can affect our experience of an image, I began to experiment with contemporary NASA images, printing them using a nineteenth century technique of photogravure. The photogravure is created by making an etching plate with a negative and the application of ultraviolet light—which then, after processing the plate—can be inked up and fed through an etching press. I used carbon black ink where materials have been burned to produce the ink. When pressed onto fine Hahnemuhle paper, the black ink takes on a dense but sultry texture which feels appropriate to represent the cold and dark void of space. 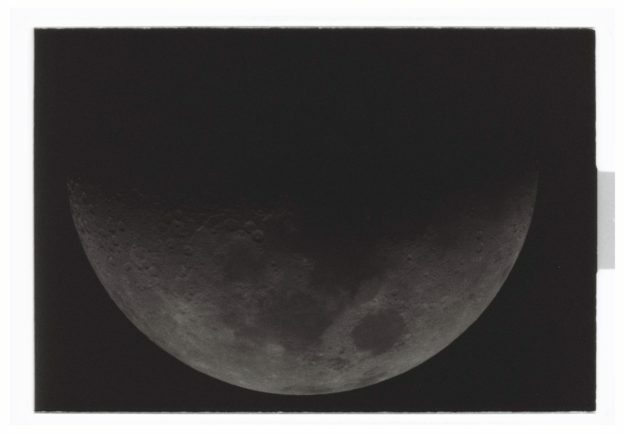 In the exhibition at Four Corners Gallery, I exhibited these photogravure prints alongside a stereoscopic photograph of the Moon which allowed visitors to consider how our perception can fool us into thinking a 2-Dimensional image is 3-Dimensional. Credit: Henry Draper, from the archive at the Museum of the History of Science, Oxford. The production of these works ultimately led to my current research question, which enquires into how photographic practice and theory can contribute to the field of astronomy, and vice versa. Following the Four Corners residency in 2015, I began my practice based MPhil at the Royal College of Art to explore these questions in more depth. During the first year of my practice-based research degree, I stumbled across the work of August Strindberg, a nineteenth century playwright. One day, Strindberg left an unexposed photographic plate under the night sky, hoping to capture some images of the night sky. Without the lens of a camera, Strindberg failed to capture images of stars and planets but did create nebulous images which occurred when elements of the weather interfered with the surface of the photograph. Strindberg called the resultant images “celestograph” which, when compared to the word “photograph” (light writing), could mean “writing caused by the heavens”. As I learned of Strindberg, it occurred to me that I had been creating what he would call “celestographs” for quite a while. I began to think about different ways of exploring the idea of celestography through my practice. For a long time I have been working with the cyanotype process, a nineteenth century printmaking process which uses iron based salts When these are mixed together, they become sensitive to ultraviolet light from the Sun. In early 2015, I attended The Story of Light festival in Goa with my colleagues Jaden Hastings and Nachiket Guttikar, with the aim of highlighting the relationship between the Sun and Earth-based matter. We did this by creating a world record sized cyanotype, 10 x 6 metres across. Participants were able to see the cyanotype mixture change colour before their eyes, and were able to create shadows on the print itself with their bodies, Goan Christmas decorations in the shape of stars and a Sun-shape made of palm leaves. 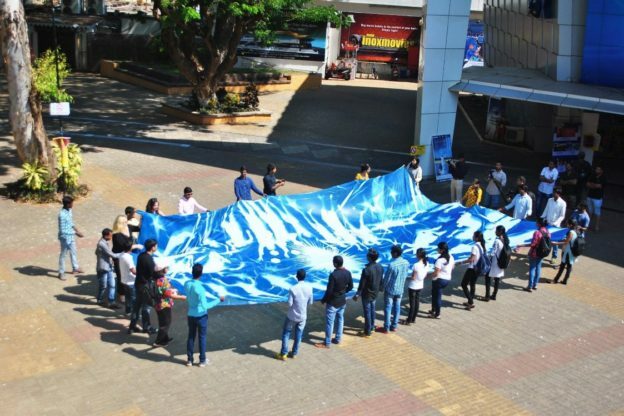 World Record Cyanotype, Jaden Hastings, Nachiket Guttikar, Melanie King, The Story of Light Festival Goa, 2015. I had also been experimenting with solargraph pinhole cameras which can be set up to track the passage of the Sun with extremely long exposures of up to a year. The resultant images show the orbit and tilt of the Earth around the Sun, as the Sun appears to move through the sky. Both the cyanotype and the solargraph could be described as “celestographs” as with both processes photons from the Sun affect photosensitive material. Following my experiments with celestial light, I then began to think about materiality of objects that originate from beyond the Earths’ atmosphere, such as meteorites and lunar dust. In 2016, I worked with the Royal School of Mines at Imperial College London to create what I call “Meteotypes”. I sourced some meteorites online and took them to be milled into fine dust in the Earth Science and Engineering department in the Royal School of Mines, with the permission of Katharina Kreissig and Barry J Coles. The fine dust was then mixed with extender and carbon black to create meteorite-imbued etching ink. Photographs of the meteorites were printed with their-own ink, meaning that the meteorite print is imbued with the very same material that it represents. 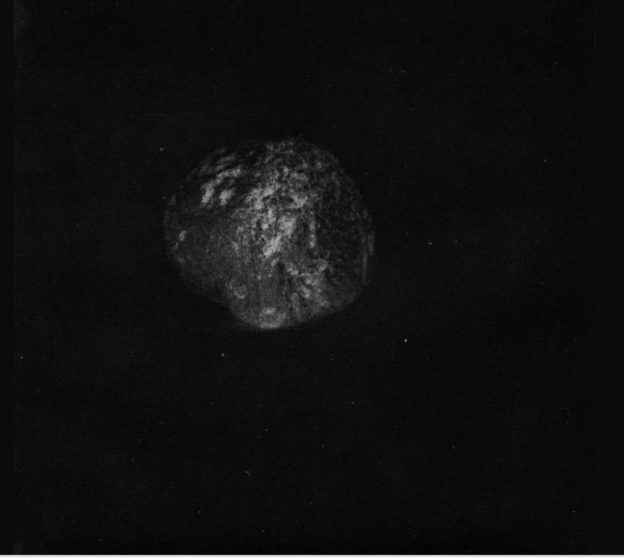 As the viewer observes the print, they see the photographic record of the meteorite and the traces of the physical material itself. To conclude this section, these “celestograph” experiments have led to my own deeper understanding in astronomy and photography. These material print-based experiments help myself, and others who are introduced to the processes, to understand astronomy in a very tangible way. Using these processes we are physically handling materials that are affected by or come from outside of the Earths’ atmosphere, we can see the materials alter before our own eyes. This experience is directly in contrast with digital astrophotography, where everything happens within the camera or on a computer screen. 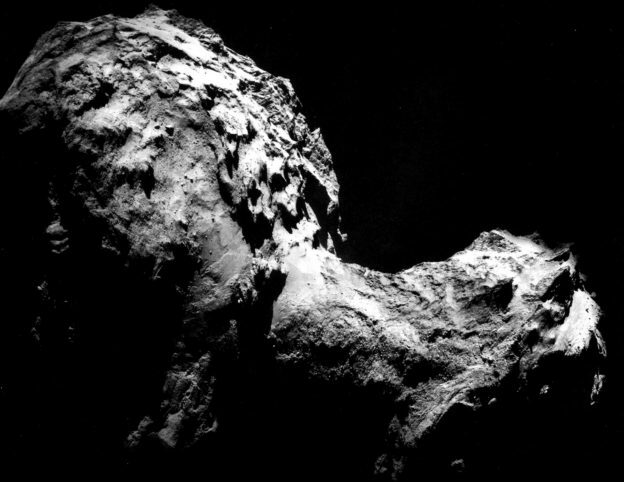 This paper does not discount the field of digital astrophotography, as without digital technology astronomical discoveries would not be happening at such an astounding rate. Additionally, the field of astronomy also opens the door to new possibilities in photography and art-making. In the field of photography, we are often content with using digital cameras that utilise the visible spectrum of light, but what happens when we begin to use infrared filters and films, for example? 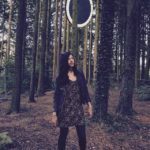 I am the co-director of Lumen Studios and super/collider, where both organisations actively encourage astronomical observation within a wide range of communities. Lumen particularly focuses on how a range of different cultures have responded to the Sun, Moon and stars throughout time, taking into account Paganism, Christianity, Islam and beliefs of ancient civilisations such as the Aztecs, Maya, Aboriginals and Egyptians. Both Lumen and super/collider organise trips to dark sky areas to encourage participants to view the night sky without light pollution. A recent study “The new world atlas of artificial night sky brightness” by Fabio Falchi, suggests that only a third of people living on Earth have seen the Milky Way, because our view of the stars is increasingly obscured by manmade light. Every year, Lumen organizes a residency to Atina in Italy for twenty artists from all over the world. During this residency, artists are taken to Campo Catino observatory for deep sky observation up in the mountains where it is dark enough for the Milky Way to be seen. The artists’ accommodation and studio is also situated within a small rural town, where it is easy to find a dark spot for viewing the stars and there is a telescope on site for artists to view the Moon and planets at any time during the fortnight. Often, artists comment that they have never seen through a telescope before or seen the Milky Way, which can make for an unforgettable experience. At the end of the residency, there are two exhibitions in Italy and London where the artists can present artworks responding to the residency. Similarly, super/collider organised an inspiration trip to Kielder Observatory, situated close to the Scottish border. The observatory established the Northumberland Dark Sky Park, now the third biggest dark sky park in Europe – specifically focused on protecting the skies from light pollution. The observatory offered us a number of workshops on our trip, including deep sky observations where we saw the Hercules Globular Cluster and the Ring nebulae. We were also able to see the planets Saturn and Jupiter close up, and had the chance to look at the Sun through a number of different telescopes. Both Lumen and super/collider are passionate about bringing an engagement with astronomy to the urban environment. We often collaborate with Paul Hill of Sirius Astronomy, who brings his collection of telescopes to London, speaks to visitors in an accessible and informative way and helps a range of communities view the Moon, planets and stars. Most participants are shocked that it is possible to see such exotic objects from London, currently the largest city in Europe. In both scenarios, participants are given the opportunity to view their world with a new perspective. When participants view planet Saturn through a telescope, or the Milky Way galaxy from the Earth for the first time, shock and awe is a common response. And no wonder, as the more we look at the universe in the field of astronomy, the more we realise that conscious life has only inhabited a tiny portion of the entirety of time and space, and is therefore incredibly precious. One perspective when faced with the brief existence of human conscious life would be to feel utterly insignificant, but I believe that we are profoundly lucky to be alive given the circumstances. Not only this, but as humans we are able to ponder the existence of the universe, and express these ideas through the collaborative endeavours of art and science. As I continue my research I have been continually inspired by the relationship between the complexly intertwined fields of astronomy, photography and philosophy. Keeping in mind the idea of the “celestograph” which can be defined as “writing caused by the heavens”, I have embarked on a new series of photographs. “Ancient Light” aims to capture light that has been travelling for thousands, if not millions of years, directly onto photosensitive film. Since May 2017, I have been collaborating with Thomas Schlichter Technical Staff Member at UCLO Observatory to photograph stars, moons and planets on film, instead of using digital capture techiques. Using the digital option, the photon is translated to electrical signals, which can be arranged to make pixels on a screen. 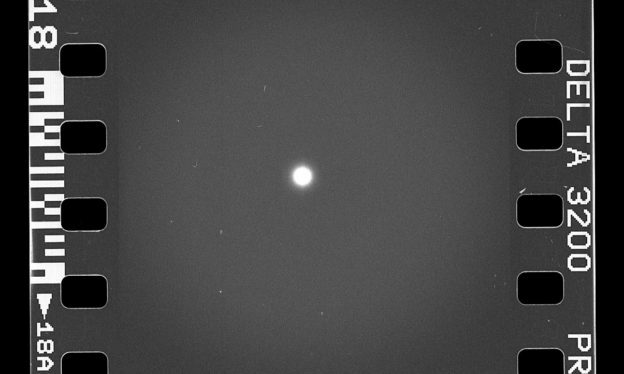 In contrast, the stellar photon is physically absorbed by the silver halide crystals, causing the silver to turn black when processed through developer and fixer. As an artist, the use of film is exciting in this context because I am able to physically handle material that has been altered by ancient light. I can use this in a darkroom by shining light through the film negative, and creating a direct print. The index as defined by CS Pierce as “a sign or representation is something which stands to somebody for something in some respect or capacity.” To clarify, an index could be the footprint which stands in for the shoe, or a bullet hole which refers to the bullet. Put simply, the analogue negative can not help but to refer to the light it receives. Though attractive, digital astro-photographs do not excite me in the same way because they are stored within the memory of a camera, and can be mediated easily with stacking software and photoshop. Many of the astronomers at the observatory remember the days when there was no option but to use analogue photographic processes, and have no desire to return to those days. 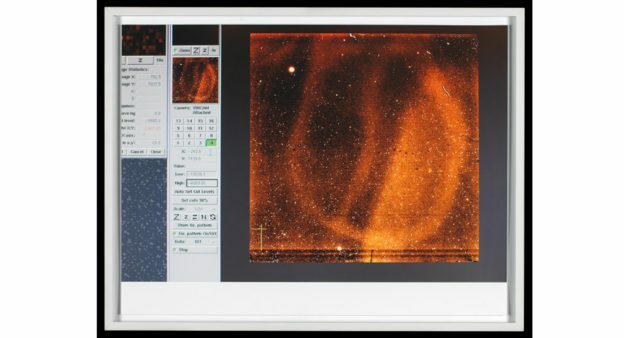 For the astronomers at the observatory, digital CCD cameras can produce quick results that are very precise, whereas the analogue photographs required the production of specialized highly sensitive photographic emulsions which needed to be processed in the darkroom very quickly. I have now visited the observatory on five occasions, and each time both myself and Thomas learned something about how to use analogue film cameras on the telescopes and how to adjust to the specific challenges of astrophotography. In 2016, I visited the Boulby laboratory in North Yorkshire with a group of artists who took a journey 1100m beneath the surface of the Earth to visit Boulby Underground Laboratory. 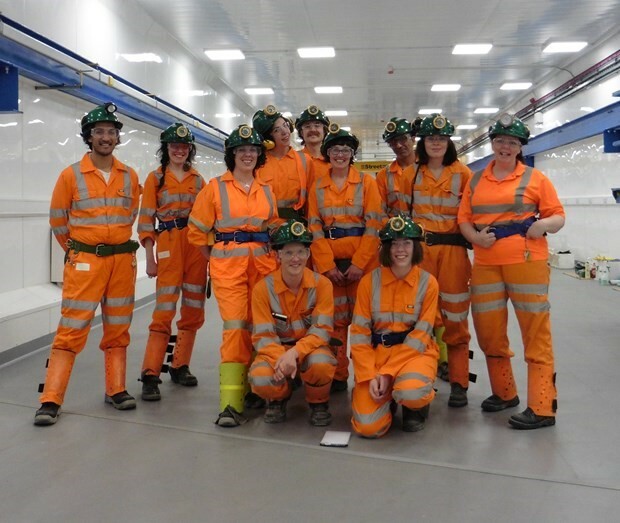 There we met scientists working on the detection of dark matter and were introduced to the Boulby Underground Laboratory by Dr Cham Ghag. After the visit we embarked on a series of exhibitions and events entitled the “Laboratory of Dark Matters”. This project was initiated by artist Susan Eyre, and funded by Arts Council England Grants For The Arts, Science and Technology Facilities Council and The Institute of Physics. Inspired by the idea of “celestography”, I set myself the challenge of considering how it would be possible to make a “celestograph” using non-visual data. From my research into astronomy and physics, I have discovered that astronomical imaging makes use of a number of different forms of electromagnetism. Earlier on in this article, I have mentioned using an optical telescope to capture visible light from stars. However, astronomy tells us that our view into the universe is limited because some stars and galaxies are too far away or too dim to be observed by visible light alone. Over the past two centuries, the field of astronomical imaging has now allowed us to “see” more than ever before, with other forms of electromagnetism (such as x rays, infrared and ultraviolet. In this way, science has extended our visual powers to visualise objects that cannot be seen with the eye alone. For the Laboratory of Dark Matters project, I was inspired to use photographic processes to visualize “invisible” cosmic ray data which is sensed by the dark matter detector. After working on a room-sized deconstructed oscillograph installation to visualize pulsar stars beyond the visible light spectrum, I decided to create a Cosmic Ray Oscillograph. Physicists Sally Shaw and Dr Cham Ghag arranged for me to work with wave form data from the LUX (Large Underground Xenon) Detector. The wave form data showed wave form height and duration, so it seemed sensible to “map” these wave forms to sound. Artist and former astro-physics major Steve Aishman was able to help me do this. For the Guest Projects exhibition, I installed a phosphorescent spinning disc in a darkened room. 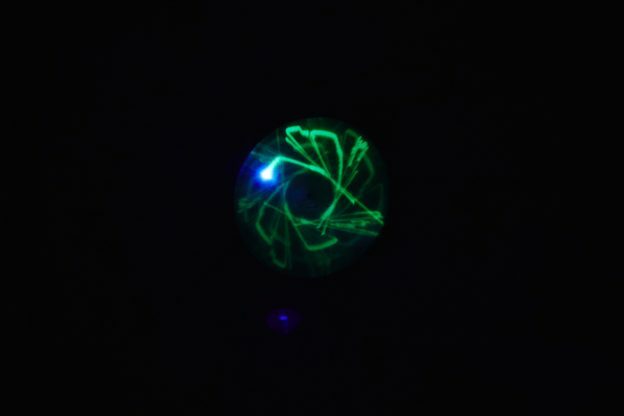 The cosmic ray data ‘sounds’ controlled a laser connected to a solenoid, which then projected light onto the phosphorescence to create emergent drawings. As the phosphorescent disc spun on its’ axis, interesting lines emerged and overlapped, before fading away. Inspired by the history of photo-acoustics, I then used the installation to create camera-less photographs, where photosensitive paper took the place of the phosphorescence. The collaboration allowed for the wave form data to be experienced in a tangible, physical way. Visitors were able to hear the data translated to sound, and see this sound translated to visual movement. Before this experiment, the data could only be experienced in number form. Sally Shaw explains how the photo-acoustic installation reminded her that she is working with physical phenomena. As cosmic rays are invisible to human eyes, projects such as this help us to visualise phenomena that could not be seen otherwise. This means that technical information that could usually only be interpreted by scientists, can be made accessible for practitioners in other fields. Shaw also suggests that by visualising the data, the data becomes more tangible to scientists. This is a comment that I would not have forseen, but is highly important. Following this experiment, I am keen to consider how it might be possible to visualize other forms of data using photo-acoustics and full room oscillograph installations. Collaborations in Art and Science. What can photographic practice and theory contribute to the field of astronomy, and vice versa? I am still at the beginning of my research journey, but here are some conclusions from my collaborations so far. One of the most important cultural messages that we have obtained from the field of astronomy, is that looking into space teaches us to understand our place in the universe. Photographs such as the “Pale Blue Dot” show us that conscious life inhabits a tiny portion of the entirety of both time and space, and is therefore incredibly precious. 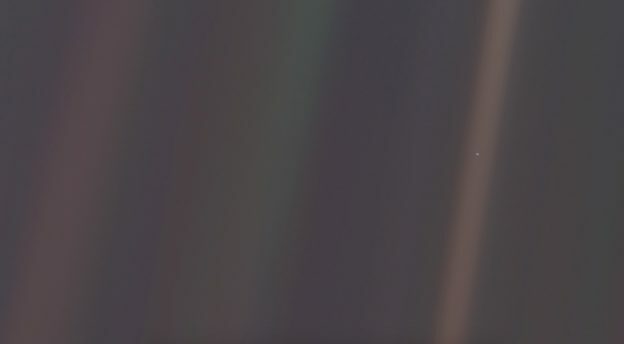 I believe that astronomical images such as the Pale Blue Dot encourage us to think critically about how we treat our planet, live our lives and how we work as artists. Scientific imaging also requires the use of a variety of instruments that can detect a wide range of electromagnetic frequencies such as visible light, infrared and ultraviolet. These detection methods offer new ways of seeing the world, simultaneously offering new range of creative possibilities for artists. I demonstrated this during my collaboration with Dr Cham Ghag and Dr Sally Shaw on the “Cosmic Ray Oscillograph”, we used wave form data and photo-acoustic techniques that had not been combined together before. On the flipside, photographic practice enables us to understand the phenomena of light in a tangible way. As an artist interested in analogue photography, I have learned more about how light works through my artistic practice. The simplicity of a process such as cyanotype means that I am able to share this knowledge easily to a wide range of audiences, from eminent physicists with a background in light-based technologies to small children who can learn about light intuitively. 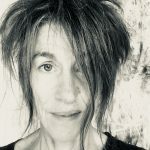 Both Thomas Schlichter Sally Shaw commented on the “tangibility” of the collaborations, allowing them to see their own work in a new way. Another important point is that artists and photographers are used to being critical about the production of images, in a way that astronomers are not. Elizabeth Kessler’s “Picturing the Cosmos” demonstrates how astronomers have taken a visual language from the field of art. 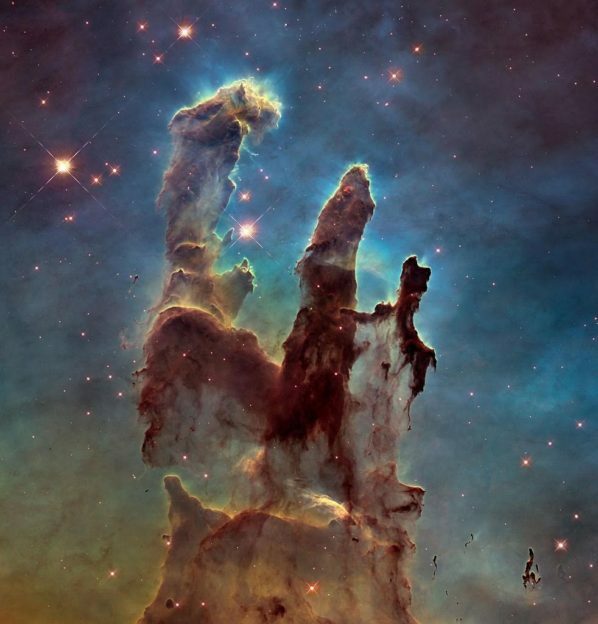 These Hubble images are incredibly prevalent, however they somewhat lack imagination. From my collaborations so far, it is clear to me that both art and scientists should collaborate to find new and experimental ways to represent astronomical phenomena. My ongoing research explores how artists and scientists have approached astronomical imaging, in many different ways. For example, I am very interested to see how scientists working on the Event Horizon Telescope will use their data to visualise the black hole at the centre of the Milky Way Galaxy. I posit that astronomical technologies are advancing at an ever-increasing pace, but conceptually we are lagging behind. In other words, we find it hard to understand how developments such as the discovery of gravitational waves can affect our perception of the universe at large. I believe that artistic and photographic theory is well versed in the field of philosophy, and can offer a way of making sense of wild discoveries and new technologies. I posit that more research can be done on the philosophical implications of new technologies, with the same rigour that has been applied to the “straight” photograph.